SOAR: A network and directory of the Southern Oregon arts community, featuring artists, artisans, galleries and art related businesses in the Rogue Valley, Ashland, Medford, Jacksonville, Grants Pass and surrounding areas for art lovers, collectors, patrons, designers and decorators. Can't find the artist you're looking for? We've had several prominent artists move out of the area recently, so we created a page for them and moved their listings to it. Click HERE to take a look. I have a passionate and spiritual reaction to nature. And I paint my subjects in an attempt to recreate that emotional truth and excitement. I paint primarily with water media because I love its transparent quality, vibrant colors and unpredictability. Spirited interpretations of my subjects are somewhat realistic yet ethereal. Celebration happens for me when I successfully express what I attempt to paint…and to share…a soul connection. 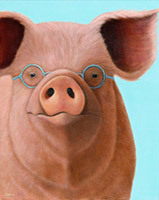 Dana Feagin is a member of HeARTs Speak, Artists Helping Animals. An award-winning oil painter, Dana focuses completely on animals, capturing their serious and silly side in a whimsical manner. Dana donates 100% of her sales proceeds to animal charities! She also donates artwork to help animal rescue groups across the country with fundraising efforts. Lori Garfield's DNA determined that she should be an artist. She sees and feels the world around her more acutely than many, bringing an awareness of the oneness of the heartbeats on our planet. "I limit my focus to North American animals and plants. Perhaps when I create a familiar critter you'll be reminded of actions that may impact them. I hope my classical atelier training is enough to bring a smile, pause at Nature's splendor and reflect on our connected lives." A self-taught artist whose evocative style is accomplished with acrylics, inks, metallics and pigments. 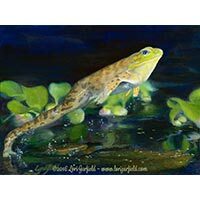 Pegi's paintings are in private collections in Switzerland, Australia and throughout the US, and were featured in the 2009 edition of "International Contemporary Masters." Her work is often available at many galleries and artisans' markets all along the West coast. I begin my watercolor paintings with an idea and a drawing. I build the painting layer by layer, drawing lines and shapes, looking for rhythm and feeling. My color sense is a reflection of my childhood in New Mexico fused with colors from my home in the Northwest. My goal is to go beyond the surface to find joy, wonder and a bit of mystery. I have a degree from the Academie of Art and a Biology degree from the University of Riga, Latvia. My sculptures in bronze are in private collections in Latvia, Germany and England. 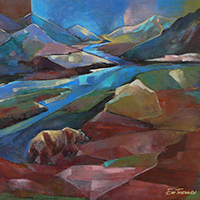 When I came to Alaska from Latvia in 1997 I was overwhelmed by its beauty; I was able to observe Alaska's magnificent brown bears and painting them with Alaska scenery became my passion. In 2003 I came to Applegate, Oregon. My paintings are exhibited in Ashland, Medford and Jacksonville galleries. With a history in fashion design, Silvia Trujillo has 20 years experience in fine art study, painting, and teaching. 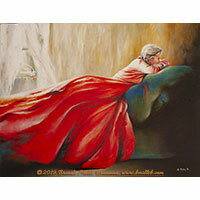 She is a master colorist; emphasizing color harmony, and works in impressionist, realist, and abstract styles. "My goal is to consistently produce paintings that are uniquely original and that express my love of nature." Founder Hannah West created SOAR to drive traffic to member sites, increase online visibility for our region's art community and promote its members to residents and visitors. Listings are $35/year and include syndication of your blog, posting your classes, shows and events on our online calendar and press releases at our companion blog Art Matters!. We also offer reasonably priced advertising. Let us promote YOU! SOAR has an affiliate relationship with Ipower, our host on the internet - if you decide to host your site with them after clicking one of our affiliate links, we will receive a referral commission. You can help support SOAR's efforts to promote Southern Oregon artists by using our link or sharing it with a friend who needs a hosting service! All images on this site © their respective creators, used here with the artist's permission.